Congratulations to our Business 100 honorees and our Keynote Speaker Bill McDermott, CEO of SAP. You exemplify our cultural heritage and we are thrilled to profile you in this issue, which marks the beginning of our 33rd year in publishing. Bill McDermott’s story is that of the underdog who dreams big, overcomes all odds, and succeeds and inspires others in the pursuit of their own goals and dreams. His is one of the great stories of the Irish in America, stories that are the heartbeat of this magazine. Like McDermott, this magazine is a bit of an underdog, too. When we published our first issue at the end of 1985, no one was betting that we would succeed. It was a hard scrabble and fast scramble beginning. We had little money and few resources, but whenever the urge to give up overtook us, a story, lost to history, would make itself known and demand to be heard. The chance to tell it would lift our spirits. One such story, reprinted in this issue, came my way in 1996. It’s of John J. Kiernan, who started life as one of six children born to Irish immigrants in Brooklyn. With just a grade school education, Kiernan built up a successful financial news agency. 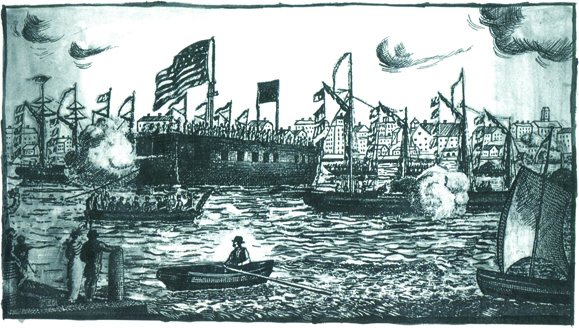 Each day he would row his skiff out into New York Harbor to collect days-old newspapers from the ships from London and other ports. He’d mine the papers for financial information, which he would sell to his clients. Today his office is the site of the New York Stock Exchange. And so to our present day, and another inspirational story. Bill McDermott has a vision to make the world run better using SAP software, and is doing just that on a global level. His colleagues at SAP Labs Ireland have been to all corners of Africa delivering “train-the-trainer” sessions in coding as part of Africa Code Week, an initiative that this year will have reached 1.3 million children introducing them to the language of coding. And another initiative, Autism@SAP program just celebrated five years in partnership with Specialisterne Ireland, enabling over 100 young people with autism start roles in Irish industry. Ireland is just one small piece of SAP’s global reach, which is now in 190 countries, with 87,000 employees who are encouraged to take paid leave to bring their expertise to charitable organizations. I met with McDermott in at the end of October at SAP headquarters in New York. His office, on a high floor of the Hudson Yards complex, overlooks New York Harbor, where in the distance, Lady Liberty holds up her lamp against the sky. I think of the many thousands of Irish immigrants including McDermott’s ancestors, who three generations back, made their way into this same harbor. Says McDermott, “You can never forget where you came from.” His hardscrabble roots inform his every move, and should he need a reminder, he just has to look out the window at the magnificent icon of freedom and hope for so many immigrants. McDermott is not alone in effecting change. The honorees profiled in the following pages represent some of the most innovative individuals and impactful organizations doing business in the United States and Ireland. From start-ups to long-established entities, they are integral to the global economy, and a testament to the ever-expanding scope of power, and accomplishment of the Irish in America. We rejoice in your success, and celebrate our shared culture and heritage. You come from a people of great tenacity and will to survive – we are all members of the same tribe. And knowing our history we have empathy for those who are struggling today, whose idea of the American dream is a safe roof over their heads and a chance to educate their kids. I’m sure I speak for us all when I say that the Irish are also happy to protect those Americans of many races and religions who protected us on our journeys. Let’s raise a glass to a Happy New Year for one and all. When Kate McCulley stated, “…I believe is our duty to speak up for all the immigrants of today”, is shy suggesting that those who violated the nation’s immigration laws by entering the U.S. illegally and unlawfully residing here are as much deserving of our support as immigrants who came here with permanent visas, completely obeyed all our law, and honorably served in the U.S. military?